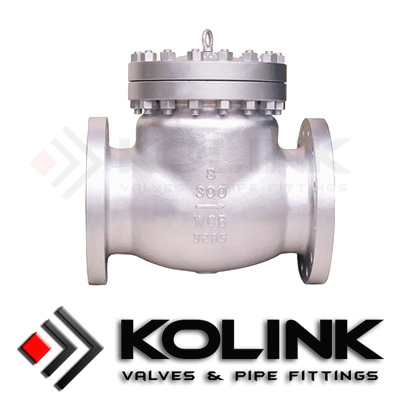 Swing check valves are the most common and best check valve for general-purpose use. Of all check valve designs, these valves produce the lowest pressure drop, when compared with other check valves of the same size. They feature a simple design that is easy to maintain. The swing check valve functions by allowing flow forces to move the disc from the closed position to the fully open position in a sweeping arc motion against the hinge-stop inside of the valve body. Due to the weight and center-of-gravity location of the disc and swing-arm assembly, the valve will return to the closed position should flow become interrupted or reversed. External counterweights mounted on the hinge pin are sometimes used to increase or decrease the reaction time and speed of the disc returning to the closed position. Seating surfaces are typically flat, which means the radial disc positioning onto the seat is not critical, except that it must be flat onto the seat. Swing check valve discs are not stable unless they are in systems with steady flow and are in the fully open position. 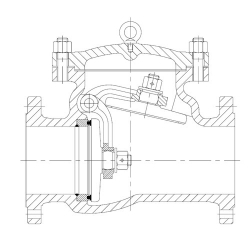 As the disc/hinge assembly center of rotation is a fair distance from its pivot point, it will take a relatively long period of time for swing check valves to close upon flow stoppage or reversal. During this time, reverse-flow forces may experience a large increase in energy from flow and pressure buildup. This situation can cause high-energy water hammer when the disc slams onto the seat. The Swing Check Valve can be enhanced with many options such as a lever and weight, which is designed to make the valve close faster and prevent slamming.